I am so very excited to be hosting another giveaway for you!!! This one is sponsored by Vitaphenol Skincare. I have just recently tested and reviewed the Vitaphenol Dry Skin Regimen and absolutely adored it. Vitaphenol is a spa-quality and clinically effective skincare line. Vitaphenol uses a unique range of antioxidants in their skincare. I found the products to be very gentle yet totally effective. Be sure to check out my review if you haven't already or if you are just curious to learn more about this skincare line! One Pammy Blogs Beauty reader will win an entire skincare regimen for their skin type: Dry, Normal, Oily, or Acne-Prone. The Vitaphenol range was designed with 4 steps: Purify, Tone, Repair, and Hydrate. So, the winner will get four products, worth a total of $390, specifically designed for their skin type. How great is that? If you would like to enter, please keep reading after the jump for the rules and the contest entry form! The Prize: A complete Vitaphenol Skincare Regimen for your skin type: Dry, Normal, Oily or Sensitive. Each package is worth $390.00 and includes a cleanser, toner, serum, and moisturizer. You must be 18 or older or have your parents permission to enter. You must reside in the US or Canada. Giveaway open to US and Canadian residents only. Contest ends on Midnight June 2nd! The winner will be chosen at random using Random.org. 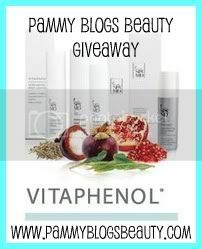 The winner will be announced here on Pammy Blogs Beauty! The winner has 48 hours to respond or a new winner will be chosen. Good luck everyone! I hope you all enter as this is a really great skincare system! I think you will love it! And my oh my what a give away!! It looks amazing girl!! !